These are dried hanging bats from Indonesia. The smaller bat (1235-10) is the lesser short-nosed fruit bat. 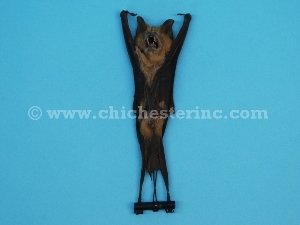 The larger size bat (1235-20) is either the large fruit bat (Rousettus leschenaulti) or the diadem leaf-nosed bat (Hipposideros diadema), also known as the diadem roundleaf bat. Please see below for photos and measurements. Genus and species: Cynopterus brachyotis, Rousettus leschenaulti, Hipposideros diadema. Wild. 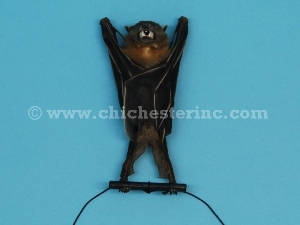 These bats are not endangered and are not subject to CITES controls. Not for export in small quantities due to extensive regulatory requirements.